Yes, yes, you’re right! 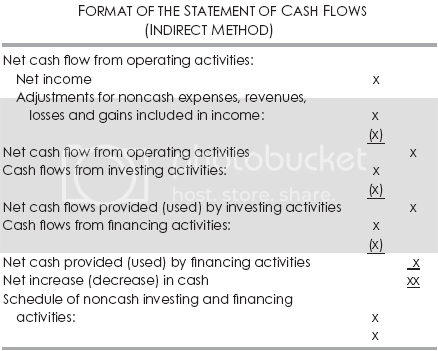 I have been talking about Statement Of Cash Flow (basic) a lots on the previous post. In this post I am going to make it more advance, more valuable for you, your company (business) with case example and analysis previews. This post is dedicated to try to cover most critical questions around the analysis of the statement of cash flow. Hopefully it will give you a better understanding and make you done with your cash flow analysis. The Statement of Cash Flows provides financial managers, controllers and CFOs with information about the company’s cash receipts and cash payments for operating, investing, and financing activities. Examples include accounts receivable, accrued receivables, inventory, and prepaid expenses. Examples include accounts payable, accrued liabilities, and deferred revenue. 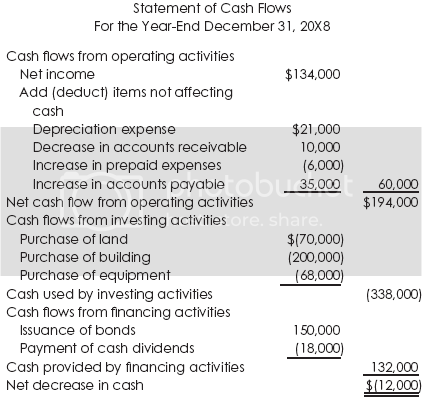 What Useful Information Is Obtained From Doing A Comparative Analysis (on cash flow statement)? Comparative statements of cash flows hold clues to a company’s earning potential, risk, and liquidity. These statements show the repeatability of the company’s sources of funds, their costs, and whether such sources may be relied on in the future. The uses of funds for growth and for maintaining competitive position are revealed. An analysis of comparative Statements of Cash Flows helps in understanding the entity’s current and prospective financial health. It facilitates planning future ventures and financing needs. Comparative data help the Financial Manager, Controller and CFO identify abnormal or cyclical factors and changes in the relationship among each flow element. The statement is a basis for forecasting earnings based on plant, property, and equipment posture. It assists in appraising growth potential and incorporates cash flow requirements, highlighting specific fund sources and future means of payment. Will the company be able to pay its obligations and dividends? The statement reveals the type and degree of financing required to expand long-term assets and to bolster operations. The Financial Manager, Controller and CFO should compute for analytical purposes cash flow per share equal to net cash flow divided by the number of shares. A high ratio indicates the company is liquid. We now discuss the analysis of the Operating, Investing, and Financing Sections of the statement of cash flows. 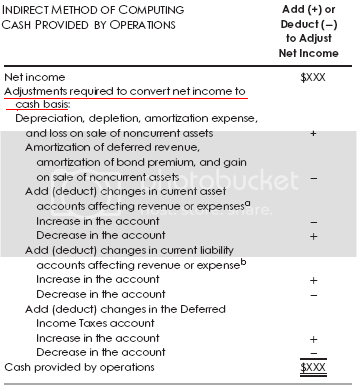 What Should You Look At In Evaluating The Operating Section (of a cash flow statement)? An analysis of the Operating Section enables the financial executives (Controller and CFO) to determine the adequacy of cash flow from operating activities to satisfy company requirements. Can the firm obtain positive future net cash flows? The reconciliation tracing net income to net cash flow from operating activities should be examined to see the effect of non-cash revenue and non-cash expense items. A high ratio of cash from sales to total sales points to quality sales dollars. The cash debt coverage ratio equals cash flow from operations less dividends divided by total debt. Cash flow from operations less dividends is referred to as retained operating cash flow. The ratio indicates the number of years current cash flows will be needed to pay debt. A high ratio reflects the company’s ability to repay debt. Another related ratio is cash flow from operations less dividends divided by the current maturities of long-term debt. These ratios could include adding to the denominator current liabilities or other fixed commitments such as lease obligations. The cash dividend coverage ratio equals cash flow from operations divided by total dividends. It reflects the company’s ability to pay current dividends from operating cash flow. The capital acquisitions ratio equals cash flow from operations less dividends divided by cash paid for acquisitions. The ratio reveals the entity’s ability to finance capital expenditures from internal sources. The cash return on assets equals cash flow from operations before interest and taxes divided by total assets. A higher ratio means a greater cash return earned on assets employed. However, this ratio contains no provision for the replacement of assets or for future commitments. The ratio of cash flow from operations divided by total debt plus stockholders’ equity indicates the internal generation of cash available to creditors and investors. The ratio of cash flow from operations to stockholders’ equity indicates the return to stockholders. An award under a lawsuit is a cash inflow from operating activities that results in a nonrecurring source of revenue. An operating cash outlay for refunds given to customers for deficient goods indicates a quality problem with merchandise. Payments of penalties, fines, and lawsuit damages are operating cash outflows that show poor management in that a problem arose which required a non-beneficial expenditure. What Investing Activities (of a cash flow stetement) Should be examined? An analysis of the Investing Section identifies an investment in another company that may point to an attempt for ultimate control for diversification purposes. It may also indicate a change in future direction or change in business philosophy. An increase in fixed assets indicates capital expansion and growth. The CFO should determine which assets have been purchased. Are they assets for risky (specialized) ventures, or are they stable (multipurpose) ones? This is a clue as to risk potential and expected return. The nature of the assets shows future direction and earning potential of product lines, business segments, and territories. Are these directions viable? The financial executives (Controller and CFO) should ascertain whether there is a contraction in the business arising from the sale of fixed assets without adequate replacement. Is the problem corporate (e.g., product line is weakening) or industry-wide (e.g., industry is on the downturn)? 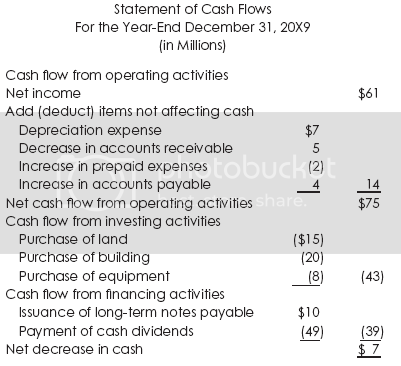 What Is The Importance Of Financing Activities (of a cash flow statement) ? An appraisal of the Financing Section will help the financial executives form an opinion of the company’s ability to obtain financing in the money and capital markets as well as its ability to satisfy its obligations. The financial mixture of equity, bonds, and long-term bank loans impacts the cost of financing. A major advantage of debt is the tax deductibility of interest. However, dividends on stock are not tax deductible. In inflation, paying debt back in cheaper dollars will result in purchasing power gains. The risk of debt financing is the required repayment of principal and interest. Will the company have the funds at maturity? Where can the company go for funds during times of tight money? By appraising the financing sources, the financing preferences of management are revealed. Is there an inclination toward risk or safety? The ability of a company to finance with the issuance of common stock on attractive terms (high stock price) indicates that investors are positive about the financial health of the business. The issuance of preferred stock may be a negative indicator because it maymean the company has a problem issuing common stock. An appraisal should be made of the company’s ability to meet debt. Excessive debt means greater corporate risk especially in an economic downturn. The problem is acute if earnings are unstable or declining. The reduction in long-term debt is favorable, however, because it lessens corporate risk. The financial executives should appraise the company’s dividend paying ability. Stockholders favor a company with a high dividend payout. Why are non-cash activities worth considering? A bond conversion is positive because it indicates that bondholders are optimistic about the company’s financial well-being and/or the market price of stock has increased. A conversion of preferred stock to common stock is favorable because it shows that preferred stockholders are impressed with the company’s future and are willing to have a lower priority in liquidation. How is managerial planning facilitated by analyzing the Statement of Cash Flows? Profitability is only one important ingredient for success. Current and future cash flows are also important. Management is responsible for planning how and when cash will be used and obtained. When planned expenditures require more cash than planned activities are likely to produce, managers must decide what to do. They may decide to obtain debt or equity financing or to dispose of some fixed assets or a business segment. Alternatively, they may decide to reduce planned activities by modifying operational plans such as ending a special advertising campaign or delaying new acquisitions. Or they may decide to revise planned payments to financing sources such as delaying bond repayment or reducing dividends. Whatever is decided, the managers’ goal is to balance, over both the short and the long term, the cash available and the needs for cash. Managerial planning is aided when evaluating the Statement of Cash Flows in terms of coordinating dividend policy with other corporate activities, financial planning for new products and types of assets needed, strengthening a weak cash posture and credit availability, and ascertaining the feasibility and implementation of existing top management plans. The ratio of net cash flows for investing activities divided by net cash flows from financing activities compares the total funds needed for investment to funds generated from financing. Are fund sources adequate to meet investment needs? Similarly, the ratio of net cash flows for investing divided by net cash flows from operating and financing activities compares the funds needed for investment to the funds obtained from financing and operations. The analysis and evaluation of cash flows is essential if the Controller or CFO is to appraise an entity’s cash flows from operating, investing, and financing activities. The company’s liquidity and solvency positions as well as future directions are revealed. Inadequacy in cash flow has possible serious implications because it may lead to declining profitability, greater financial risk, and even bankruptcy. The company issued long-term notes payable for cash. Land, building, and equipment were acquired for cash. 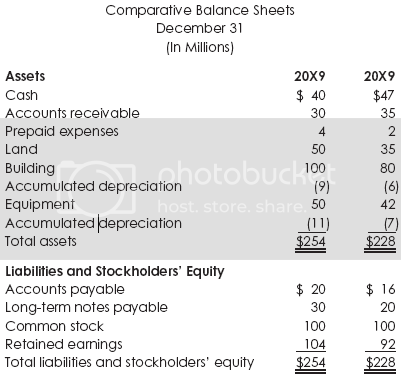 The Analysis (what you can learn from the above cash flow statement? A financial analysis of the Statement of Cash Flows reveals that the profitability and operating cash flow of the company improved. This indicates good earnings performance as well as earnings being backed up by cash. The decrease in accounts receivable reveals better collection efforts. The increase in accounts payable is a sign that suppliers are confident in the company and willing to give interest-free financing. The acquisition of land, building, and equipment points to a growing business undertaking capital expansion. The issuance of long-term notes payable indicates that part of the financing of assets is through debt. Stockholders will be happy with the significant dividend payout of 80.3 percent (dividends divided by net income, or $49/$61). 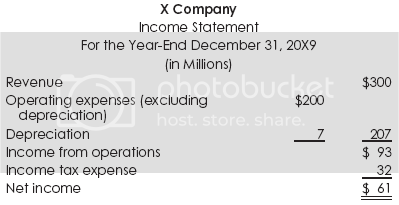 Overall, there was a decrease in cash of $7, but this should not cause alarm because of the company’s profitability and the fact that cash was used for capital expansion and dividend payments. We recommend that the dividend payout be reduced from its high level and the funds be reinvested in the profitable business. Also, the curtailment of dividends by more than $7 would result in a positive net cash flow for the year. Cash flow is needed for immediate liquidity needs. An analysis of the Statement of Cash Flows reveals that the company is profitable. Also, cash flow from operating activities exceeds net income, which indicates good internal cash generation. The ratio of cash flow from operating activities to net income is a solid 1.45 ($194,000/$134,000). A high ratio is desirable because it shows that earnings are backed up by cash. The decline in accounts receivable indicates better collection efforts. The increase in accounts payable shows the company can obtain interest-free financing. The company is in the process of expanding for future growth as evidenced by the purchase of land, building, and equipment. The debt position of the company has increased, indicating greater risk. The dividend payout was 13.4 percent ($18,000/$134,000). Stockholders look positively on a firm that pays dividends. The decrease in cash flow for the year of $12,000 is a negative sign. Related Topics:cash flowCash Flow StatementCash Flow Statement Analysis Case ExampleComparative Analysis Of Cash Flow StatementEvaluating Operation Section of cash flowFinancing ActivityInvesting ActivityManagerial Planning and Statement Of Cash FlowOperating ActivityThe Analysis Of Statement Of Cash FlowWhat investing activity should be examined?What Is The Importance Of Financing ActivitiesWhy a non-cash activities worth considering?